Admiral John William Kime, 72, a former U.S. Coast Guard Commandant who was passionate about maritime safety and environmental protection issues, died Thursday in Baltimore,Maryland, following a battle with cancer. 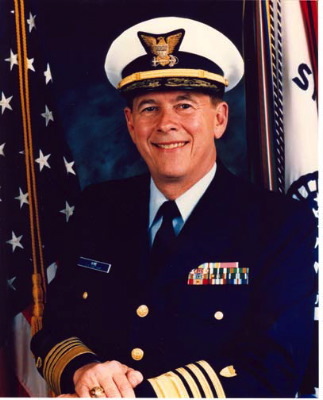 Admiral Kime served as commandant from 1990-94, where he oversaw implementation of the landmark Oil Pollution Act of 1990 and established the position of drug interdiction coordinator. During his Coast Guard career, his assignments included commanding the Coast Guard district in Long Beach, California, directing operations for the district in Miami, heading the technical division in New York and Washington, serving as captain of the port in Baltimore, and chief of the Coast Guard's marine safety, security and environmental protection office. After retiring from the Coast Guard after 41 years of service, Kime served as chief executive officer of ship management companies in the United States, United Kingdom, Norway and Sweden, and as CEO of a quality services company in London. He worked with BIMCO, the world's largest private shipping organization, until last year, and with the BT Federal Board of Directors until his death. Born in Greensboro, North Carolina, Kime graduated from Baltimore City College in 1951 and from the U.S. Coast Guard Academy in 1957. He received a Master of Science degree in naval architecture and marine engineering, and the professional degree of Naval Engineer from the Massachusetts Institute of Technology, in 1964. He was a registered professional engineer and 1993 recipient of the United Nations World Maritime Prize. Survivors include his wife, Valerie; and two sons. Kime will be buried with full military honors at Arlington National Cemetery, the Coast Guard said. Former Coast Guard Commandant Admiral J. William Kime, a career maritime safety officer and champion for the marine environment, died Sept 14, 2006, in Baltimore of cancer. He was 72. Kime served as the Coast Guard’s 19th commandant, from 1990 until 1994. He was nominated to the post by President George H.W. Bush, and used the position to revamp international shipping standards, making merchant, oil and liquefied natural gas vessels safer for seamen and the environment. He also oversaw implementation of the landmark Oil Pollution Act of 1990, created after the Exxon Valdez oil spill in Prince William Sound, Alaska in 1989. “He worked very hard in bringing the international community together for what was needed in changing commercial vessels,” said retired Rear Adm. Gordon Piche, of Annapolis, Maryland. Piche worked for Kime in the Coast Guard Marine Safety Office from 1984 to 1988. Kime’s Coast Guard career began in 1957 after he graduated from the U.S. Coast Guard Academy. His first assignment was as deck officer on the Coast Guard cutter Casco, followed by duty as a Loran navigation station commander on Wake Island in the Pacific. After earning masters degrees in naval architecture and marine engineering and a professional naval engineering degree from the Massachusetts Institute of Technology in 1964, his career path moved into naval engineering and safety, although he also continued to be assigned operational commands. He commanded the Marine Safety Office in Baltimore, worked as a member of the U.S. delegation to the International Conference on Tanker Safety and Pollution Prevention, led the U.S. delegation to the International Maritime Safety Committee and Marine Environmental Protection Committee and headed the structural design team of the Polar-class icebreakers. As a flag officer, he served as 11th Coast Guard District commander, headquartered in Long Beach, California, and as Chief of the Marine Safety, Security and Environmental Protection office at Coast Guard Headquarters in Washington, D.C. While working in Long Beach, he was summoned to help guide the response to the Exxon Valdez spill, a tragedy that influenced the rest of his career. For his work in changing commercial shipping regulations, he was awarded the 1993 International Maritime Prize by the International Maritime Organization. Born in Greensboro, North Carolina, Kime moved to Baltimore as a youngster and attended Baltimore City College, the nation’s third oldest public high school. After he retired, he worked for several ship management companies in the United States, Great Britain, Norway and Sweden. He also worked with BIMCO, the world’s largest private shipping organization, and served on the BT Federal Board of Directors until his death. Survivors include his wife Valerie and two sons, Edward W. Kime of Bel Air, Maryland, and James G. W. Kime of Columbia, Maryland. He will be buried in Arlington National Cemetery, with many active-duty and retired Coast Guardsmen, flag officers and friends at the graveside, Piche said. Retired Vice Admiral James Card, who served as a captain of a port under Kime’s district command, called him a mentor and an “older brother” whose leadership will continue to influence the Coast Guard and the maritime industry. “His three buzzwords were ‘people, balance and excellence.’ What he did was show us how everyone could be a winner, and he helped us win,” Card said. Posted: 15 September 2006 .